Cicero saw publication as a means of perpetuating a distinctive image of himself as statesman and orator. He memorialized his spiritual and oratorical self by means of a very solid body of texts. Educationalists and schoolteachers in antiquity relied on Cicero's oratory to supervise the growth of the young into intellectual maturity. 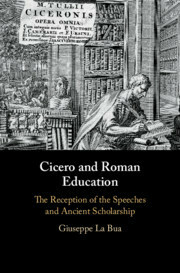 By reconstructing the main phases of textual transmission, from the first authorial dissemination of the speeches to the medieval manuscripts, and by re-examining the abundant evidence on Ciceronian scholarship from the first to the sixth century CE, Cicero and Roman Education traces the history of the exegetical tradition on Cicero's oratory and re-assesses the 'didactic' function of the speeches, whose preservation was largely determined by pedagogical factors. 1. Cicero presents himself: writing, revision and publication of the speeches; 2. Beyond the author: Cicero's speeches from publication to the medieval manuscripts; 3. Between praise and blame: Ciceronian scholarship from the early Empire to Late Antiquity; 4. Teaching Cicero. Giuseppe La Bua is Associate Professor of Latin Literature at the Sapienza University of Rome. His research interests focus mainly on the relationship between religion and literature in the Roman world. His previous publications include L'inno nella letteratura poetica latina (1999) and numerous articles on pagan centos, Persius, archaic tragedy, Ciceronian rhetoric and oratory, Horace, Ovid, Apuleius, Roman declamations and the Latin prose panegyrics.